Acoustics arrays can be used for imaging, directing the motion of particles, and (at high intensities) therapeutic applications. 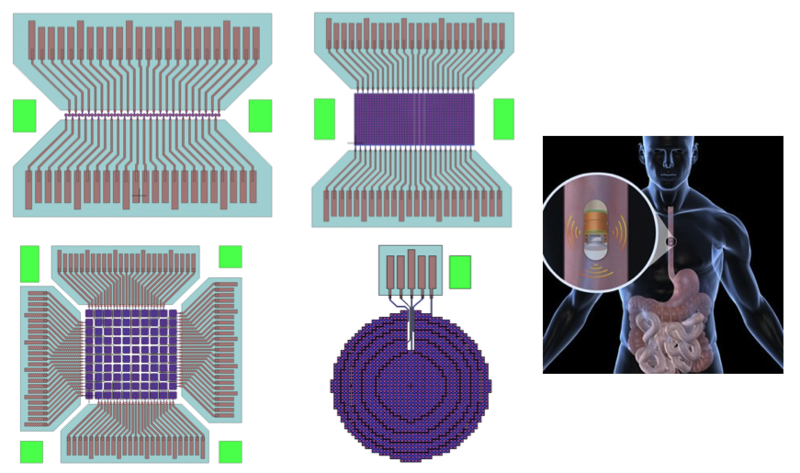 Current methods of producing transducer arrays begin with bulk piezoelectric ceramics, complicating fabrication of high frequency arrays and necessitating large drive voltages. However, thin-film piezoelectrics such as lead zirconate titanate enable piezoelectric micromachined ultrasound transducers to be readily fabricated and driven a low voltages. The higher frequency ranges enabled allow much higher resolution medical imaging than is currently feasible, while retaining the ability to focus and steer the acoustic beam. MRSEC researchers have fabricated a first generation of these devices, and are examining their utility for medical imaging and fundamental studies of micromotors and nanomotors in randomized acoustic fields.